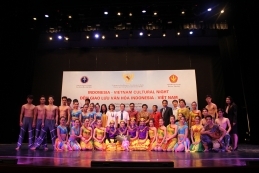 On Wednesday, dated June 10, 2015, delegation team of Tadulako University (UNTAD) visited Hanoi in order to attend the evening performances of cultural event between Indonesia and Vietnam in Hanoi, Vietnam. As well as student assistant is Leydies Puspawaty which is one of the international office staff. Bada dance Roya and Nusantara Dance. On the other hand in 09.30 am to 12.00 pm held the signing of the MoU between the Embassy and the Hanoi University and also between Hanoi University and UNTAD. Afterwards at 20.00 pm to 21.30 pm nightly performances of cultural activities between Indonesia and Vietnam in theaters Vietnam Dance College, Hanoi. The agenda at this show is welcome by the Rector of Vietnam Dance College and also welcome by the Rector of UNTAD then proceed with the submission of souvenirs. This was followed by the appearance of the dance art team collaboration UNTAD and Vietnam Dance College, which on this occasion they present Pontano dance. At the end of the team’s performance art UNTAD gave souvenirs woven sarong Central Sulawesi or better known as Donggala sarong. After that, followed by a dance performance from the Roya Bada art team UNTAD and Soul Soldiers of Vietnam Dance College, and then Nusantara Dance of UNTAD art team and Yem O’i Dao of Vietnam Dance College. At the end of the event covered by the collaboration of dance that Motaru Dance by the art team UNTAD and Vietnam Dance College.